For previous news articles see the monthly archive at the foot of this page. Following a taxing five days including a trip to Ross County and a cup tie at Easter Road, Queens are back at Palmerston on Saturday with St.Johnstone as visitors. This will be only their fifth home game of the season having played ten away from home but they go into the match knowing a victory will keep them top of the table. The only player doubtful is skipper Steve Bowey who twisted an ankle at Easter Road on Tuesday night. Commenting on the cup game manager John Connolly said, "Considering the travelling we've had lately I think the lads put up a good show against Hibs but there were we a lot of tired legs by the end of the match. Just look at some of the other results in the competition, such as Clyde and Brechin and the scoreline doesn't look so bad. After the Hibs game I told the players to have the rest of the week off. I think they deserve it!." "I'm told that Hibs officials, stewards and police were saying the information came from us that we'd have a travelling support of about two hundred for the game. This is ridiculous for I don't think anyone connected with Queen of the South would say anything like that. I'm angry and frustrated at the way our fans were treated and I'll be calling Hibs to establish how the situation arose and where they got the figure from. "We have a big fan base in the South West and many more supporters in the Central Belt so it stands to reason we'd have a good travelling support although the 1800 plus did come as a big surprise to me as well. But it was great! "On behalf of the board I'd like to thank each and every one of you for your support and hope you'll be out in force again for the St.Johnstone game." Eight-year old Queens fan John Moore managed to lose his Nokia mobile phone last night at Easter Road, he was sitting in the middle section behind the goals and would very much appreciate it if the person who found it would get in touch through the website. Speaking from the team bus on the way back to Dumfries tonight manager John Connolly admitted to being disappointed that the CIS Cup tie was lost due to two "schoolboy errors" early in the match. Said the manager "Our plan was to go out, keep it tight and silence the home fans, however it didn't work out that way as the two Hibs goals came in the first twenty three minutes and were both the result of very basic defensive errors, we really did shoot ourselves in the foot. It took us a while to find our feet but we did come back into the match and in the end gave Hibs a good run for their money, our goal when it came was just too late as there was not enough time to do anything about the result after Alex had scored with that last-minute penalty kick. "I'd also like to thank the very large travelling support, they were once again magnificent for us tonight, it was superb to see so many Queens supporters there." On the subject of the large travelling support, somewhere in the region of 1600 Queens fans turned up tonight and many were very unhappy to have missed the opening part of the match as Hibernian attempted to shepherd the entire away support in to the stadium through only two turnstiles, eventually a third was opened but by that time the game had already begun. Many fans missed more than ten minutes of the game. On a more positive note it was good to see former Queens favourite Peter Weatherson at the game supporting his former team mates. Queens left this afternoon for tomorrow nights cup tie against Hibs at Easter Road. Before departing John Connolly said, "It's a big match for us and we want to prepare properly in a professional manner. We did it for the Ross County match and it paid off, so here's hoping it will work for us again. But let's not kid ourselves, Hibs are lying fifth in the Premier League and it will be a very difficult match. It's no good 'digging in' and hoping for a replay at Palmerston for this one's got to be won on the night - it will go to extra time and penalties if necessary. It's important to keep a clean sheet for as long as possible and silence the home fans for the longer the match goes on the more anxious Hibs will become and if we can score the first goal then, who knows, we could win it. However it's a luxury tie for us. Hibs are favourites and we have nothing to lose, so we'll be giving it a real go. Coming on the back of our defeat on Saturday we'd like to get back on track and give a good performance but it's all down to us and how we play". Asked if he thought all the trauma and uncertainty at Easter Road over the weekend would affect Hibs performance John replied, "Not at all, they are a professional outfit and I think Bobby Williamson and his players will be concentrating solely on the match itself. "I know Bobby quite well from his Killie days and it was actually him and Walter Smith who tested me for my final coaching badge some years ago". It is hoped the squad will be at full strength tomorrow night with Derek Lyle fit again and available for selection. Gary Wood will also be keen to play against his childhood heroes. Gary felt unwell at Aviemore on Saturday and had to be left at the hotel then picked up again on the return journey. The match kicks-off at 7.45pm. Following a weekend of trouble and strife, Hibs manager Bobby Williamson graciously took time off to speak to the website about the game. "We're expecting a tough match and will be treating Queens with the utmost respect. I have been watching from afar what John Connolly has been achieving at Palmerston and have tremendous admiration for him. I know John well and from time to time we have chats on the phone about football and I'm certain he'll have his team really geared up for this one. We're in a no win situation here. If we go through then it's just what's expected of us but if we lose you can just imagine what will be said. Queens have some dammed good players in their side at the moment and several of them have competed at the highest level, so no way will we underestimate them." Colin Scott takes the Internet Fan Club Man of the Match award for the defeat at Ross County with second place going to Eric Paton and third shared between Paul Burns and David Bagan. All of the other scores for the match can be found on the 'Latest Report' page and the Player of the Season league table will be updated tomorrow evening. Speaking after the match John Connolly conceded that the game was lost through bad defending at a set piece, "There was nothing in it between Ross County and ourselves but they just edged it on the day by netting the all-important goal which won the game. It was a very bad goal to lose and all down to poor marking at a free-kick and we certainly paid the penalty. We had three or four good chances in the first half which we didn't capitalise on and just before the half time whistle their 'keeper pulled off a vital save from Joe McAlpine. If that had gone in it could well have made all the with us coming out for the second half a goal up. We put them under a lot of pressure in the last half hour and even in the final minute a shot from Davie Bagan shaved the post. But it just wasn't to be however it's our first defeat in six games and you can't win them all". In the South of Scotland League match at Palmerston, Queens beat championship challengers Girvan by two goals to nil to retain top spot in the table. Emilio Jaconelli put Queens ahead in twenty minutes and five minutes before half time Sean Ferrie slid home a cross from Steven Sloan to complete the scoring. A good win which no doubt satisfied Paddy Atkinson and Gordon Hyslop. Queens look to make an addition to the pool with the signing of Newcastle lad Tony Ross. The eighteen year old midfielder is due to put pen to paper over the weekend, he was formerly with Walker Central in Newcastle. The good news for all Queens fans is that Brian Reid has signed an extension to his contract which was due to expire at the end of the year, the big central defender is now signed until the end of the season. Since Brian joined the club Queens have lost only one game - that 2-0 defeat at Palmerston by Raith Rovers. Look out for some TV and Printed Press coverage of Queens this weekend, Dougie Vipond from BBC Sportscene was at Palmerston on Thursday and hopefully we will feature on the Saturday lunchtime show. As well as being the featured match on Scotsport we believe that there may also be a preview of the Hibs CIS Cup match on Sunday afternoon and Border TV are looking to provide an extended preview of the Doonhamers matches over the next four days. There are also some printed press features planned over the weekend so keep a lookout. Our cup-tie against Hibs on Tuesday evening will bring back happy memories to many connected with football including four Palmerston personnel who have had a close relationship with the Easter Road side - manager John Connolly, physio Kenny Crichton and two players, Eric Paton and Gary Wood. Recalls J.C. "I was two seasons with Hibs back in the early 80s. I moved north again after two years with Newcastle United and a total of eight years in English football and was re-acquainted with my old boss from St Johnstone days, Willie Ormond, who had become their manager. Hibs were in the First Division having been relegated from the Premier League and were desperate to get back in the top grade again and we made it and finished champions into the bargain. In total I made 40 first team appearances during my time there and scored eight goals - all of them in that title-winning season of 1980-81". Eric Paton also has some fond memories of Easter Road. Said the 'free-kick king' "I signed as a 16-year-old and was a Hibee for five years. I only made 9 or 10 first team appearances but learned a lot - I should have, because in that relatively short space of time I had no fewer than four different managers". Another player who has close links with the club is our recent �30,000 signing from Berwick, Gary Wood. Born in Edinburgh he was a season ticket holder at Easter Road at the early age of 12 and has long been an avid fan. Gary, who was a member of the Berwick Rangers team which held mighty Glasgow Rangers to a 0-0 draw in the Scottish Cup two years ago admits there were always great arguments at home when Hibs and Hearts met in the local derby match. "You see" he said "All our family - myself, my brother and my sister were Hibee fans, but my father was a staunch 'Jambo' who supported Hearts so there was no love lost when they played each other". Gary still stays in Mussleburgh where he is manager of the Quayside Health Club. However, the one with the biggest dilemma is physio Kenny Crichton who has been an ardent Hibs fan for as long as he can remember. Says Kenny "I was born and bred in Edinburgh and spent my childhood days playing in the shadow of Easter Road. My nana stayed in Edinaplace in Leith which wasn't too far from the ground and I was there practically every day. On Saturdays I could hear the shouts coming from the park so I became a Hibee fan from a very early age. 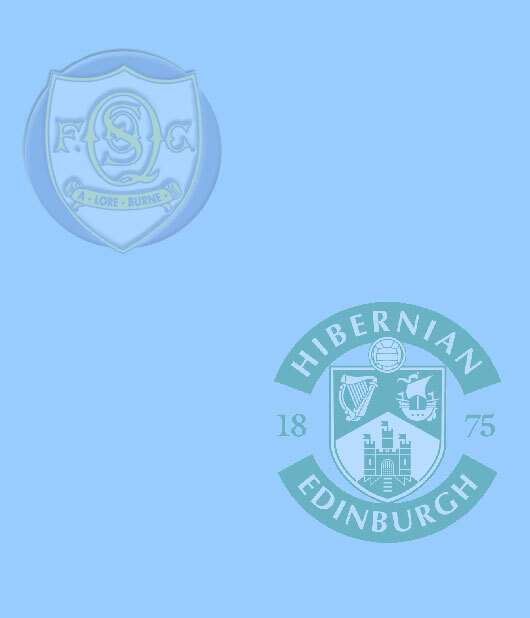 One of my first visits to see Hibs play was their famous 7-0 victory against Hearts in 1973. A few weeks later my dad took me to see them play Ayr United, we won 6-2 but shortly after that my father was seriously injured in a car accident which left him disabled, so that proved to be his last visit to see his beloved Hibs which was very sad. "I'll never forget the match in 1981 when we beat Raith Rovers to clinch the First Division Championship and win promotion back to the Premier League. Jackie McNamara was captain that day and also in the team was a winger called John Connolly, but he had a lot more hair then than he has now. There was a pitch invasion at the final whistle and I was one of the first on the park. "Another game I remember well was travelling abroad to see them beat the Hungarian side, Videoton in the U.E.F.A. Cup in 1989. Andy Goram was in goal that night and after the match I met up with him and he bought me a pint. Little did I know that some 13 years later I'd be 'rubbing him down' on the massage table at Palmerston. "All my family are big Hibs fans but since I joined Queens they have become Queen of the South supporters as well. So come Tuesday night they have a problem but have come up with a diplomatic solution - they are joining their Hibs and Queens scarves together and wearing them like that. However, deep down they'll probably be hoping for a home win". Over the years Kenny has amassed an interesting collection of Hibernian memorabilia including three autographed strips presented to him by 'Yogi Hughes' and two former Q.O.S. favourites, Derek Townsley and Ronnie McQuilter which he treasures". With the big night fast approaching all four of the aforementioned are getting excited, however, when the whistle blows they'll be no divided loyalties and they'll all be 100% for the 'Doonhamers'. Following their great win over Inverness Caley thistle on Saturday few changes are expected for the visit to Ross County this weekend. Said John Connolly, "We have a good record against Ross County in recent matches, we've beaten them in our last five matches without conceding a goal but having said that I'm not expecting an easy game. They were beaten at home by St.Johnstone on Saturday and will still be smarting from that and with us being the league leaders every team will be out to knock us off our perch. However we will be travelling up there with a lot of belief in ourselves. Our away from has been excellent of late, we've won five in a row and I'm informed that the last time that happened was away back in season 50/51 when we won six in a row. It would be good to equal that." Whilst scanning through the papers at the weekend a Queens fan spotted an unusual description in "The Times" it referred to delitescent Queen of the South supporters. Being puzzled ourselves we looked the word up in the dictionary and we discovered it meant, "The state of being covered or to hide oneself" translated further into football terms, "fans who come out of the woodwork for special games". However we hope all these delitescent supporters who turned up for the Caley Thistle game were suitably impressed and will be there again for the visit of St.Johnstone a week on Saturday. And remember, with Caley Thistle involved in the Bell's Cup Final on Sunday they will not be playing their scheduled league match which means Queens will still be top of the table irrespective of the result at Ross County. The internet fanclub members have voted Sean O'Connor as their Man of the Match from Saturday's superb victory over Inverness that saw Queens climb to the top of the league table. Two-goal all-action Sean just nicked the award from midfield maestro and fellow goalscorer David Bagan whilst another front-man notched the third prize as Alex Burke racked up another good score. The Player of the Season league table has been updated and can be found via the Man of the Match link and all of the other player scores can be found via the Latest Report link. Download a video clip of the goals and spot a few faces in the crowd from Saturday by clicking HERE it is over 3MB so will take quite a while on a dial-up connection. Thanks to David Gow for the clip. Make sure you catch the Scotsport programme on ITV tomorrow afternoon. As well as today's clash with Inverness being the featured match John Connolly will be in the studio to discuss the game with the regular pundits. John Connolly was lost for words at the end of the game, "Just what can I say after that" confessed the manager, "After losing a deflected goal like that many a team would have folded but again the team spirit was fantastic and we came fighting back to finish worthy winners. After they scored we just went at them and got right back into the game with a quality equaliser. Then the fans really got behind us and we just got better and better. "They did get a goal back late in the game and those final two minutes felt like an hour but we held out. In every game now we're creating a lot of chances and taking them which is a big bonus. I don't like singling out players but Burkey and Davie Bagan were outstanding - both are still quality players still capable of competing in the Premier League. It was a massive result for us today for Caley Thistle are a very good side who have the best defensive record in the league, that's us a quarter of the way through the season and we've now played every side in our league. We've still got a lot of hard games to come but with the team spirit we have now we fear no one. "And finally a big thank-you to all the fans today I appealed in the papers for a good turnout and I got an excellent response. We had over 3,500 this afternoon and I'm absolutely delighted." Caley managerJohn Robertson was full of praise for Queens at the end of the match, "We were beaten by a better team" he confessed, "We always knew it was going to be a difficult game but all credit to Queens, who fought for every ball and denied us possession and space to play football." David Bagan was thrilled with the result and also delighted to be voted Man of the Match on such a special day, but he stressed, "It was a real team effort and everyone was a hero out there this afternoon. I was with Caley Thistle last season and have some good pals in the Inverness team but it was good to beat them and tremendous to go top of the table." On the goal David said, "I just saw the gap and hit it and was delighted to see it in the back of the net. It's only my second goal for Queens but came just when we really needed it." Another overjoyed player was Sean O'Connor who featured on the score sheet for the third successive match. Said the striker, "It was a tough game but the support from the fans was marvellous, they're a good side and we did well to come back from a goal down to beat them. I'm looking forward to opening the Sunday papers tomorrow and seeing us up there at the top of the table." In an exclusive interview for the 'website' Caley Manager John Robertson said this afternoon that he was really looking forward to the match, "It's a top of the table battle and I think it will be a tremendous game" he emphasised, "I have the utmost respect for John Connolly. For a part-time club he has worked wonders since coming to Palmerston - winning the Second Division Championship and last season the Bell's Challenge Cup. They're only a point behind us in the table and I really thought John was favourite to lift the 'Manager of the Month' award for September. However I managed to pip him for it which came as a bit of a surprise but I'm sure John's time will come soon. "We took most of the squad up to Dingwall to watch Queens play Ross County in the CIS Cup a few weeks ago. They won 3-0 and I was very, very impressed with their performance. Some folk say Queens are defensive-minded but I don't agree I think they play open and attractive football. They are solid at the back with Jim Thomson and recent signing Brian Reid; adventurous in midfield with David Bagan and that human dynamo, Steve Bowey, and upfront they have Burkey and big Sean O'Connor who have rattled in eleven goals between them in the past couple of months. "This is a very tight league which is full of surprise results. Win two games and you're up near the top - loose two and you're down near the bottom. It's never easy coming to Palmerston. It's a long journey and Queens are never easy to beat on their home ground. Obviously we'll be all out to win but if we head back up the A9 tomorrow night with a draw I'll have a contented smile on my face. We'll be setting off at 4.00pm today and stopping overnight in the Glasgow area so the players are fresh for the match. Here's hoping for a great game." This Saturday will see probably the biggest league match at Palmerston for several years and everyone at the club is banking on a good turnout against the league leaders. Caley Thistle are the only side we failed to beat in the league last season so ti would be great to come out on top. Referring to the game John Connolly said, "It's a cracking match to come back to after our week off and I'm really looking forward to it. A win would take us to the top of the table and it's a long time since Queen of the South have been in that position. It's a top of the table battle, the weather forecast good and I only hope that the fans will be out in force to cheer us on. Apart from Derek Lyle we have a full squad available and the lads are just raring to go. By the way Derek is recovering really well following his injury and we're hoping he could be back in training by next week." 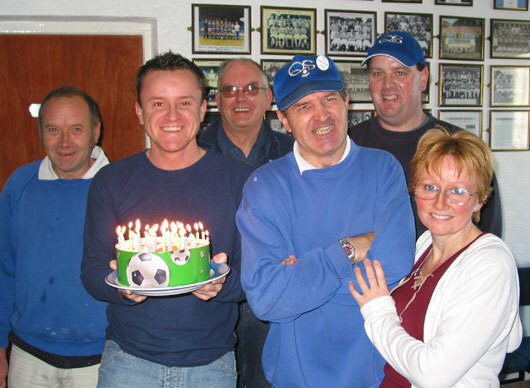 Queen's backroom staff surprised Business Development Manager Kenny Crichton this morning when they burst into the Casualty Room to present him with a spectacular birthday cake and rendition of 'Happy Birthday to You'. Kenny was overwhelmed by the gesture and particularly the efforts that the group had gone to to find enough candles. With the Scotland versus Holland European Championship play-off match scheduled for Saturday 15th November 2003 the local derby versus Ayr United originally planned for that same day has been rescheduled for Sunday 16th November 2003 with a 3.00pm kick-off. Thanks to all sponsors who are too many to mention at this point but particular thanks to the Pines Golf Centre for the courtesy of the course. Finally, I'd be remiss if I didn't, as requested, talk you all through Derek Allan's performance at the 6th hole, a 200 yard par 3. A 4 iron to about three and a half feet (which was nearer three and a half inches by the time the story was finished telling in the clubhouse!) was followed by a putt straight into the middle of the cup for a fine solo birdie. Well Done Del! This coming Sunday will see the first team squad taking part in a golfing day out at the Pines Golf Course, Lockerbie Road, Dumfries. The event is a Texas Scramble and has been organised by Joyce Middlemiss to raise funds for the many youth sides that Queens have in operation. The format of the event, which tee's off at 12.30pm is a conventional four ball Texas Scramble with a first team player, a youth team player and two sponsors from the business community making up each side. There are fifteen sides taking part and as well as the main event there is a putting and a chipping competition that is open to all, so feel free to turn up on the day and have a go at the putting and chipping competition, it's only a �1 and you can get the chance to mingle with your favourite players and of course the management including John Connolly who will be there throughout the day to see how things are going. With the first team reporting for training in the morning a good turnout is assured and you will also get to see the stars of the future as the next Willie Gibson/Paul Burns will come through this group of youngsters. The winning side in the Texas Scramble will be presented with a magnificent trophy kindly donated by John McQueen. So support the Queen of the South stars of the future and drop by at any time on Sunday to see how things are going. Goalscorer Sean O'Connor was the IFC Man of the Match after his goal secured the victory over Brechin at Glebe Park on Saturday that saw us climb to the dizzy heights of second in the league. Runner-up was Steve Bowey and third went to Eric Paton. The full scoring can be found on the 'Latest Report' page and the Player of the Season league table has also been updated and can be found via the Man of the Match link. Download a video clip of the goal and spot a few faces in the crowd from Saturday by clicking HERE it is 2.5MB so will take quite a while on a dial-up connection. Thanks to David Gow for the clip. John Connolly said he was over the moon with the final result, "It wasn't a classic game but we collected another three points and are now sitting in second place in the table" said the manager, "That's four wins in a row now so you can't ask for much better than that, at half-time we said to the lads that it could well be a one goal game and that's how it turned out but we did have about five clear cut chances and should have won more convincingly than we did, but it's never easy to win up here at Brechin. Big Sean took his goal well but he should have had a hat-trick out there today, never the less we've had a fantastic start to the season - 16 points from 8 games - you couldn't ask for much more than that. Next week we have a break for the Scotland match but the following Saturday we meet Caley Thistle at Palmerston which must rate as the 'match of the day' in our division." Goalscorer Sean O'Connor was delighted to have netted the match winner but admitted he should have scored at least three, "The wind made it very difficult" he said, "it was actually more difficult to control the ball in the first half with the wind in our backs as opposed to the second half where it was in our faces. The park was still quite hard and the ball was just skidding on the surface in that first period. But we still won and that's the important thing and that's us now second in the league which is great." Queens retained their unbeaten record in the South of Scotland League but could only manage a 1-1 draw against a fighting Stranraer Athletic side at Palmerston tonight. Queens had the bulk of the pressure during the first period but at half-time it was still goaless but only two minutes of the second half had elapsed when full-back Steven Sloan shot the home side ahead, the equaliser came midway through the half when Stranraer Athletic leading goal scorer Alan Murdoch netted with a great angular shot from thirty yards out. In the final fifteen minutes the match really came to life, Emilio Jaconelli tested the 'keeper with a raging shot while at the other end Stuart Robertson blocked a goal-bound effort with his legs, just minutes later Stranraer had the ball in the net but to the relief of the Queens players the referee blew for offside. So the game ended with honours even. Queens will be hoping to make it four wins in a row when they play bottom of the table Brechin City on Saturday. However with only one point the Glebe Park side are fighting for survival and can be hard to beat on their own ground as Kilmarnock found out. With the exception of the injured Derek Lyle, Queens have a full squad available for selection. Two-goal hero Alex Burke takes the IFC Man of the Match voting this week by a comprehensive margin and with an extremely high score of 8.68. Second place went to Steve Bowey with Sean O'Connor in third. The latest Player of the Season league table can be found via the Man of the Match link and all the scoring from Saturday can be viewed on the Latest Report page, you can also view some behind the goals footage of the goals if you follow the link at the bottom of the Latest Report page.